The short winter days are coming. This is the perfect time to design your own interactive light-up accessory. During this special one-of-a-kind FashionTech workshop, we will give you an introduction into programming and teach you electronic and e-textile basics. You will learn how to set up a wearable microcontroller and connect an LED as well as a light sensor. While designing the beanie, you will work with different materials and techniques such as using conductive thread and integrating and isolating the electronic components. 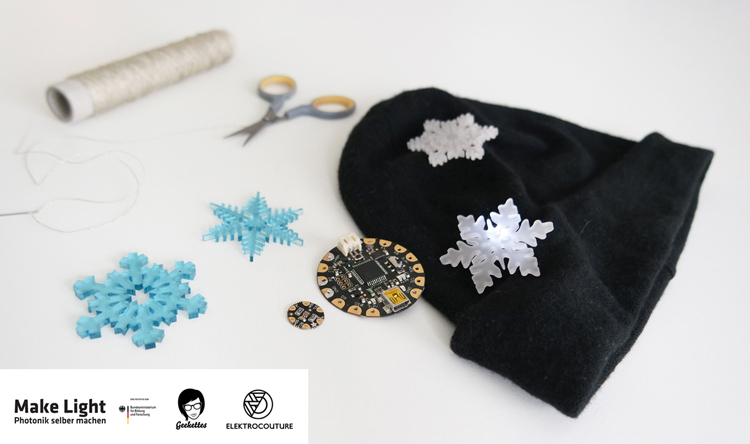 To make it all pretty and wearable, we will be sewing the electronics, along with some laser cut snowflakes, onto our beanies. Besides gaining your first hands-on experience, you will get an exclusive insight into ElektroCouture’s new FashionTech Studio. After the workshop, you will understand the use of electronics for future FashionTech projects and you can take home your personal glowing winter accessory.